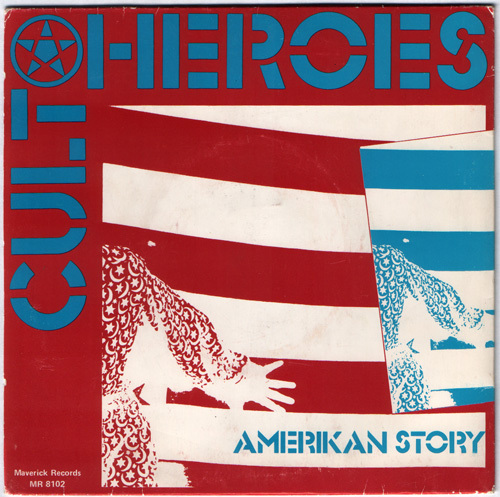 Amerikan Story has everything I like about a great song: melody, hooks, backward cymbals, gong gong, a small doze of awkwardness and originality. 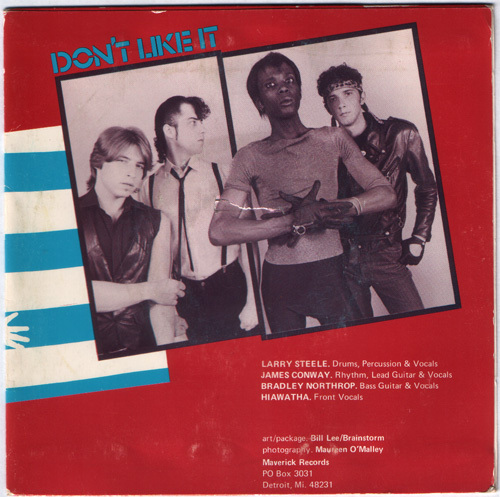 Don’t Like it is good but lacks the over the top writing heard on the a-side. 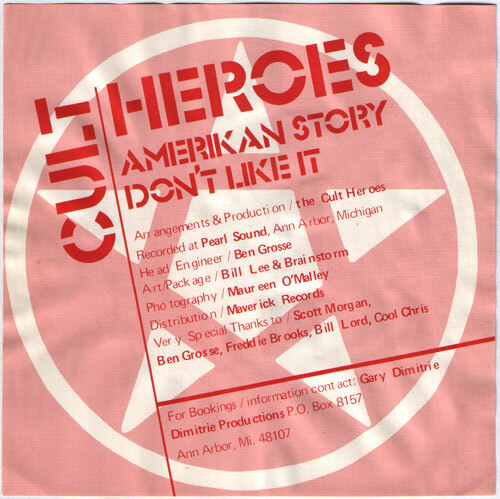 According to the Bands Of The Past page they’ve made an even better one then Amerikan Story:”From Ann Arbor, Hiawatha Baily was singer and Lee was the transvestite guitarist. Best song was “The Prince and the Showgirl” (a real toe tapper).“. Any transvestites around in todays punk bands? If not it’s a shame. 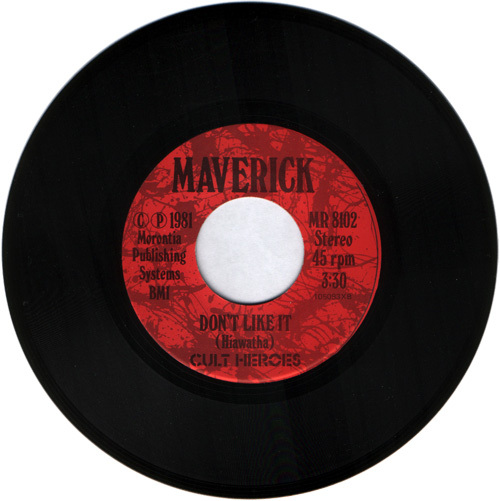 The heroes seems to be still going strong: http://www.thecultheroes.com. Thanks for this! Sounds qite a bit like the early BREAKOUTS, if one would want to compare. Strange sound but definately a goodie. Is this Zoolander on the far right of the band photo???? Ha ha it must be :)! Zoolander- LOL! He also looks like he could have appeared in one of those punk TV episodes of CHIPS or Quincy. Bad fashion sense but awesome music!! Both of their 7″s are classic, with the very loud “Berlin Wall” 7″ sounding more Radio Birdman-ish. The guitar noise on “Amerikan Story” is so catchy and Hiawatha’s singing style is cool. Great lyrics too. The band was from Ann Arbor, Michigan (about 30 miles West of Detroit) which was/is a picturesque college town where the University of Michigan is in case people didn’t know. My brother-in-law used to live there and there was a record store called Schoolkids that apparently Tesco Vee of the Meatmen used to be a buyer for. I went to the store in ’96 and found about 20 KBD 7″s all for a $1 each in these dirty old hidden boxes. Thanks Tesco. Detroit and its surrounding suburbs put out so many great unique records in the late 70’s- the Algebra Mothers 7″, Matt Gimmick EP, Coldcock 7″, Cult Heroes, Death 7″, Reruns 7″. Cinecyde had some good songs but then some total artsy clunkers too. I hung out with the cult heros in the 70’s . Being an Ann Arborite and even worked at the Restaurant where Brad Northrupt did. We partied a lot in those days. The music was raw and still is today. I am grateful to have hung out with them. They were and are a unique band who never really sold out to the establishment. To me this makes them even more famous than the conformist who likemany others get dilluted by the big $$$$. We were part of the underground punk movement in A2 and the first time I saw them was in a seedy club literally underground called the underground in 1976. Since then I have seen them play dozens of times and they havent changed much in the thirty years that I’ve known them. So hats off to all the nonconformist and the Punk underground. the live cut on “cruising ann arbor” is great too. “lexington” i think it’s called. fits right in line with the “amerikan story” 45.
i have an extra copy of the first ep for trade or sale. offers? hahaha the funny thing is the guy on the far right who apparently looks like zoolander is my dad…. IM intrested in trading buying your 45 please call at 626 2359743 thanks. This is Hiawatha of The Cult Heroes,we are and always will be rocking it up.Check us out Labor Day weekend at The Art Eat’s and Beat’s festival in Royal Oak see their web for the exact date.Though rare and expensive we do have the complete Amerikan Story package. hey hiawatha,man you guys are legends in my book i love your berlin wall single allways playing singing along to the words reading the sleeve to the teeth .i like to know more of the complete american story package.give more details on it ,keep knocking out the punks out…raidy.